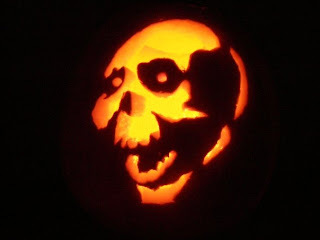 Skull done by Master Carver S, 2008. At Neurotic Physiology, Scicurious shows us that we can learn a lot about adaptive networks from slime molds. What is a slime mold you ask? They are often described as being a single humongous cell, but from what I understand, the stage where it looks like a mold and does stuff is actually a huge glom of cells, all joined together into one big cytoplasm with lots of nuclei. When it’s all big like that, it has the ability to slime around and hunt for food. Slime molds eat microorganisms that feed on decaying plant and animal matter, so the usual place to find them is among the detritus of the forest floor. 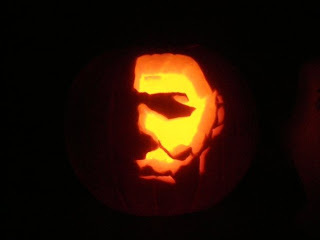 Michael Myers, carved by Krystal, 2009. Anyway, what can the mold teach us? Well we like to think that we understand networks—we build transportation systems, we lay pipes, and streets. We're pros, no? But our designs often lack the efficiency found in biological networks that occur naturally. Why? Because we're human. As Sci puts it: plans for efficiency often get tossed in favor of what people actually want. So to test the transportation network in Tokyo, scientists placed a slime mold on a map with the borders of Tokyo and used food to mark cities. They slime mold went after the food and withdrew once it got to the edge of the map, leaving filaments connecting the "cities." Researchers used this data to develop a mathematical model for expansion! So the next time you're being chased by the Blob, take notes—you could help with urban planning! They eat the same prey (as measured by what gets caught in the spider’s web or on the sticky leaves of the sundew); the presence of a sundew affects the behavior of the spider (the distance between a spider web and a sundew gets larger as the trapping area of the sundew gets larger, and the web gets larger too); and when a spider and a sundew are put in the same terrarium with a limited food supply, the presence of the spider reduces the number of seeds the sundew can produce. Poor starving plant. This post has a really nice discussion on the complexities of competition, highlighting areas open for research in case anyone has an interest in opening a little shop of horrors. 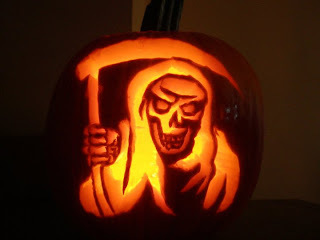 Grim, carved by S, 2010. Since we're talking about plants, did you know there's magic in kale? At the Smithsonian's Food and Think, Amanda Bensen writes that the Irish used kale for fortune telling—specifically, if a person pulled a kale plant out of the ground on Halloween, he or she would gain insights about a future spouse based on the nature of the plant (shape, taste, etc.) In addition to its fortune-telling powers, kale is also pretty healthy and there are some yummy suggestions on how to enjoy it from Food and Think. 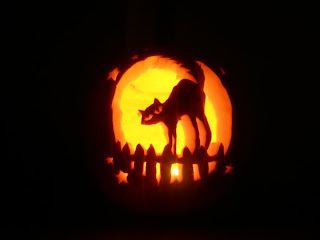 Lycanthropy in folklore and horror movies is applied to humans who change into wolves. In the psychiatric literature, though, it is a rare belief or delusion that one has transformed into an animal, or the exhibition of behavior suggesting that belief. Cotard’s syndrome is another rare condition in which the afflicted has nihilistic delusions that lead them to deny their own existence or that of the external world. The syndrome also involves the paradoxical ideation of immortality. Readers are presented with an interesting case study where the conditions were right for both lycanthropic tendencies and Cotard's syndrome to coexist.Perhaps werewolves are closer than originally thought. After the blob, carnivorous plants, and werewolves, perhaps some skepticism is in order to balance things out. Bloody Mary is a popular American Urban legend—one that I admit sort of freaks me out. (There's an interesting discussion of Mary here.) But Brad Walters of Cortical Heming and Hawing reports the legend may be the result of an optical illusion! There are a few really neat exercises contained in this post that reveal you have nothing to really worry about. It's noise at a low enough frequency that you don't consciously hear it, but your ears still sense it. The process of receiving sensory input without your conscious mind understanding where it's coming from wreaks havoc with your emotions. Specifically, researchers found that sounds between 7 and 19 Hz it could induce fear, dread or panic. Scaredy cat by Krystal, 2010. Infrasounds occur naturally in nature—the rumbling of volcanoes, earthquakes, strong ocean waves, and even winds can generate an infrasound. For this reason, it may be advantageous to perceive these sounds: Would you want to hang around if a volcano was going to erupt? It probably wouldn't do much for your survival rate if you did. But how would infrasound make you see a ghost? Infrasounds can be "powerful enough to resonate with the average human eyeball, causing 'smeared' vision. This is a phenomenon where the eye vibrates just enough to register something static -- say, the frame of your glasses or a speck of dust -- as large, moving shapes." So there's some truth then to the idea that plumbers make excellent ghosthunters. It's okay if you need to sleep with the light on though. Roosevelt didn't say anything about that. See you all next week, folks!